This page will tell you the way to make space on C drive on Windows Serve without moving any data from the drive to another partition. Download IM-Magic Partition Resizer Server to extend C drive space so that you don't need to move any file from it when it runs on low space. When C drive is full, you receive low disk space warning message. In this situation, you may move some files from C drive to D drive or delete some unnecessary files to free up space on C drive. As a matter of fact, you don't need to move any files from C drive. Instead, you can increase size of C drive with help of third-party partition software. 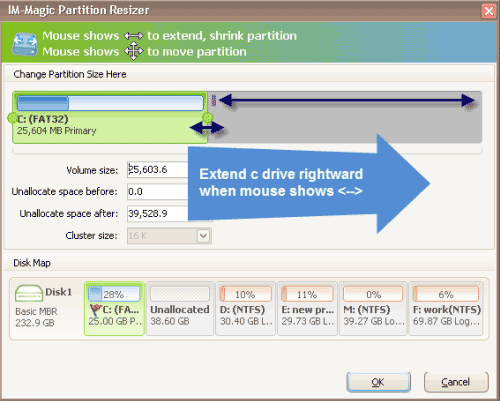 IM-Magic Partition Resizer Server can extend C drive on all Windows Servers when it is running out of disk space. Move the arrows to shrink the selected partition. Then, you can see some unallocated space. "C drive is nearly full on my Windows Server 2003, I want to look for a way to extend the C drive space because I cannot move any file from C drive to other partitions. Is there any way to increase the size of C drive? I have tried Diskpart to extend C drive on Windows 2003, but system says the selected partition cannot be extended. Can anybody give me some help?" "C drive is running out of disk space on Windows 2003. 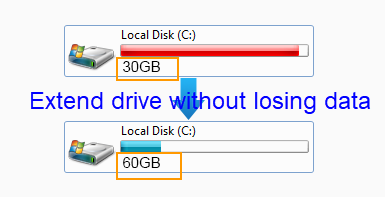 How can I extend the C drive without moving any data? Can you recommend any partition software that can extend C drive on Windows Server 2003? Thanks for any help!" When C drive gets full, the best way is to increase the size of C drive rather than to moving any file from it. IM-Magic Partition Resizer Server is capable of extending C drive on Windows Server 2003, 2003 R2, 2008, 2008 R2, 2012, SBS 2003, SBS 2012, and more other Windows Servers. This partition software enables you to extend C drive space without moving or delete any data. As long as there is free space on other partitions on the same hard disk, you can easily move the free space to expand C drive by relying IM-Magic Partition Resizer Server. IM-Magic Partition Resizer Server enables you to extend C drive on Windows Server 2003 without reinstalling or repartitioning. This partition software provides safe solution to increase the size of C drive so that you don't need to touch any data on the partition. Without third-party partition software like IM-Magic Partition Resizer Server, you can run Diskpart to extend C drive on Windows Server 2003. Diskpart is Windows built-in tool that can extend a partition which is NTFS file system and data volume. In another word, you can run Diskpart to extend C drive on Windows 2003 only if that the operating system is not installed on this partition and the file system of this partition is NTFS. If you meet the similar problem, you can use IM-Magic Partition Resizer Server to increase the size of C drive by moving free space from other partitions on the same hard disk.